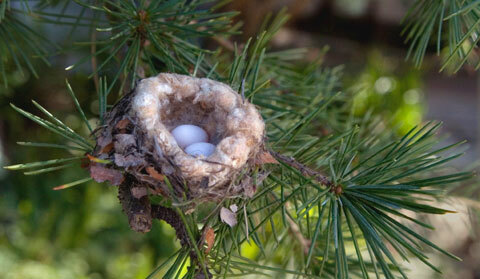 In spring, many birds are on the lookout for materials to build their nests. Blackbirds, grackles, phoebes, barn swallows, robins, and wood thrushes all use mud and a variety of other construction materials in their nests, but depending on the weather and location, those materials may be in short supply. You can encourage birds to nest around your property if you provide sources of mud and nest-lining materials. Find a good spot at the edge of a flower or vegetable garden to establish a mud hole. Use a hose or carry water to the spot in a pail and pour it into the earth. Squish the soil using your hands, a stick, or a shovel, until it reaches a muddy consistency. Try to find soil that is clayey. It is okay if there are small bits of grass or other plant fibres in the mud. Stuff an old mesh onion bag with materials such as hair (human, cat, dog, etc. ), cotton, wool, dried grass, feathers, bulrush down, bits of fabric, twigs, loose bits of thread, string, and yarn (not too long, so the birds don't get tangled up). Hang the bag from a clothesline or tree branch in your backyard. Keep the mud hole moist with a regular sprinkling of water. Replenish the onion bag with nest-lining materials as needed. You only need to supply these materials during the two or three months of late spring and summer (when nest building is under way). Canada has 16 species of owls. North America's largest hawk can no longer be found in many parts of the Prairies, where it was formerly common. They pop up everywhere when the weather mellows out. They come in all shapes and sizes. They are bird nests. And there’s more to them than meets the eye. 2. Which critter builds an underground nest made of grasses, shredded leaves and the fluffy seed heads of certain plants?